It's not a secret I love old films. I love everything about them. The push towards being modern, the way the actors move, speak and kiss. Most of all, I love the fashion. Today, in a little theater downtown, I saw my very first Hitchcock film. 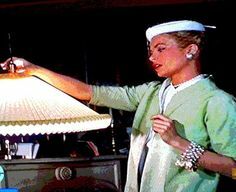 My god, Grace Kelly stole the whole movie for me. I mean, she was such a classy lady! From everything she said to climbing up a ladder in a full tulle skirt! So, I narrowed it down to five. Five of the late Princess' wonderful costume pieces from the film. 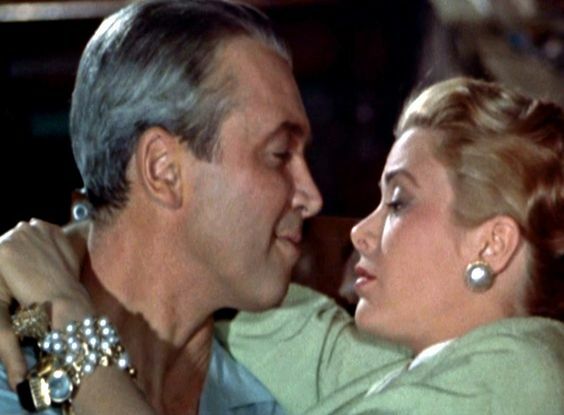 2) The Pearl Necklace Chokers. 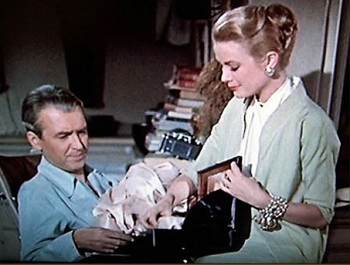 A common theme throughout the film. 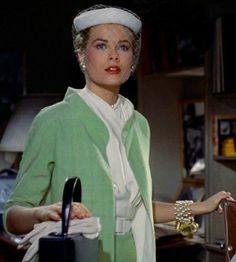 Grace had on a set three/fourths of the movie and that's not a complaint. I feel as if I I'd never know how to wear pearls until I saw them paired with low cut black tops and high neck halters. 3) The Brown Penny Loafers. I don't care what you say, these Brown Penny Loafers will always be in style in my mind. Perhaps, now more than ever, due to Grace but always because it was always a staple in my mother's closet. She wore them all the time when we grew up and now I have a pair just like Miss Fremont's from the film. I found a pair at a thrift shop. I'm now inspired to do an out fit with them! 4) The Pocketbook/Mini Suitcase. What a game changer! If I had this now... I get it. Us girls of the twenty-first century are all about our gym bags and "bucket bags" to carry an extra pair of shoes to we don't have to walk on cobble stone streets in 4 inch heels. Ugh, but this bag! If it only had more room for my penny loafers, it'd be a done deal. Well, minus this one. I just had sticker shock. 5) The Large Pearl Wrap Charm Bracelet. My favorite! 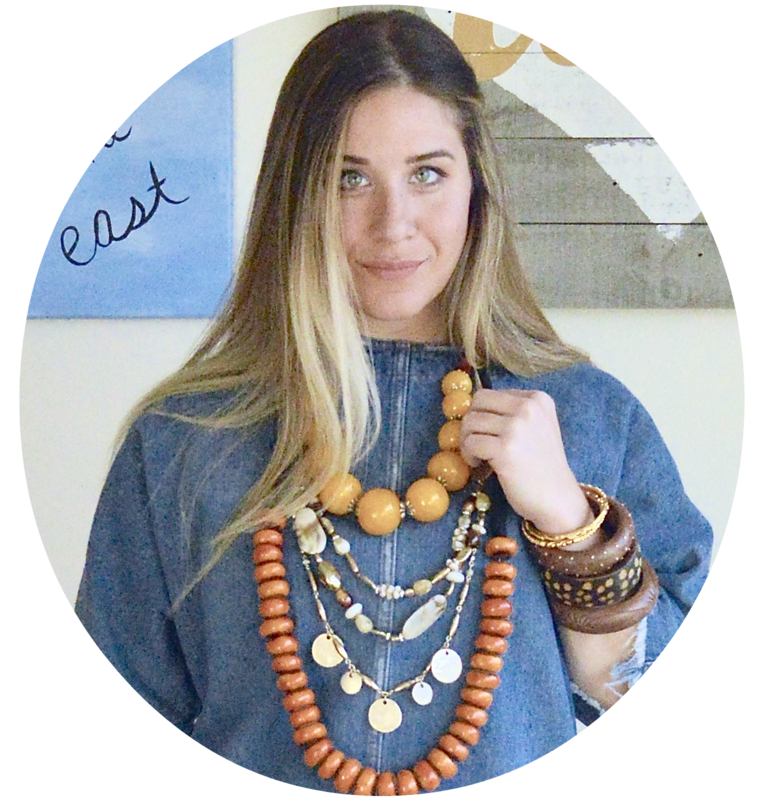 I'm not the only fashionista who is obsessed and on the hunt for this gorgeous piece of vintage jewelry. Let's just admire it again. The photo above just isn't enough. Let's be real, here...I need one. Okay, just one more.